Since 1984 we have spent the better of a week each summer on Ptarmigan Ridge on the northeast side of Mount Baker investigating the Rainbow, Sholes and Ptarmigan Ridge glaciers. The National Forest Service asked us to not our observations on Mountain Goats, and we have done so each summer since. This is an open alpine area and it is not difficult to observed the mountain goat herds. In general there are three of them in August each with there own specific ranges. One group tends to prefer the Wells Creek Drainage, one the Rainbow Creek Drainage and a third the Swift Creek Drainage with some overlap. Since 1999 we have observed all three herds each year. The mild winters have generated much higher populations than observed at any point previously. In 1987 and 1992 continuously poor weather prevented any chance to observe the mountain goats. The mountain goats head to bare rock and snow areas for much of the day, seeking out the vegetation primarily in the morning and evening. During the last seven years the population has been rising rapidly. The first few years of this interval 2003-2005 featured mild winters. The winters of 2006, 2007 and 2008 were slightly above average for snowpack in the area. The population has continued to increase. 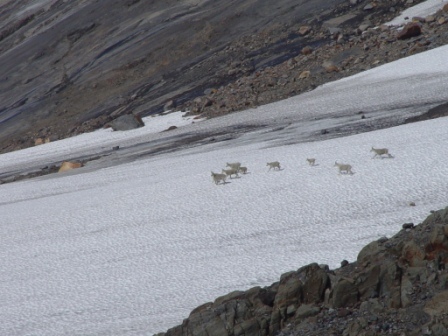 The summer of 2007 we observed a herd of 52 mountain goats below Sholes Glacier. We also observed a separate herd of at least 25 mountain goats several miles away, but just a short time after the larger herd sighting and in a different direction than the larger herd could have reached without crossing our path. 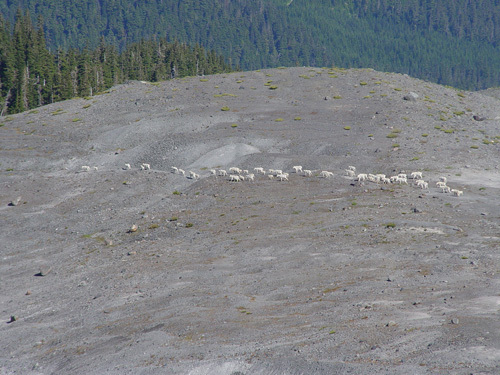 Below is a portion of the 52 goat herd seen in 2007. 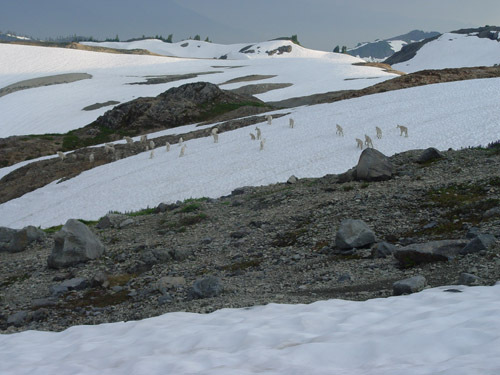 In 2009 we saw three separate herds in short order on the morning of August 3rd, 46 in the Swift Creek Herd below the Coleman Pinnacle snow patches on the north side of the ridge, 62 in the Wells Creek herd below the Sholes Glacier and 10 goats in the Rainbow herd at the mid-section of the Rainbow Glacier. 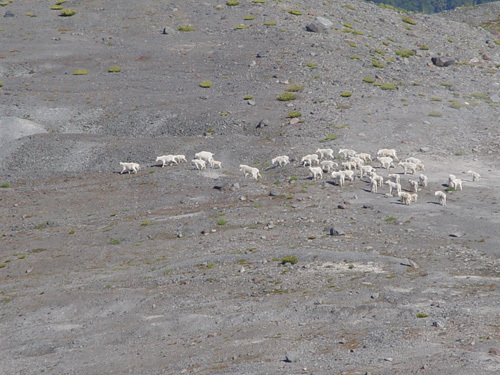 There was one lone scout as well, for a record 119 mountain goats. The range does not look overgrazed despite this large increase in population. The herds had 13, 4 and 18 kids respectively.